So here it is December and we’re still having beautiful sunny days that barely require a hoody to keep warm. 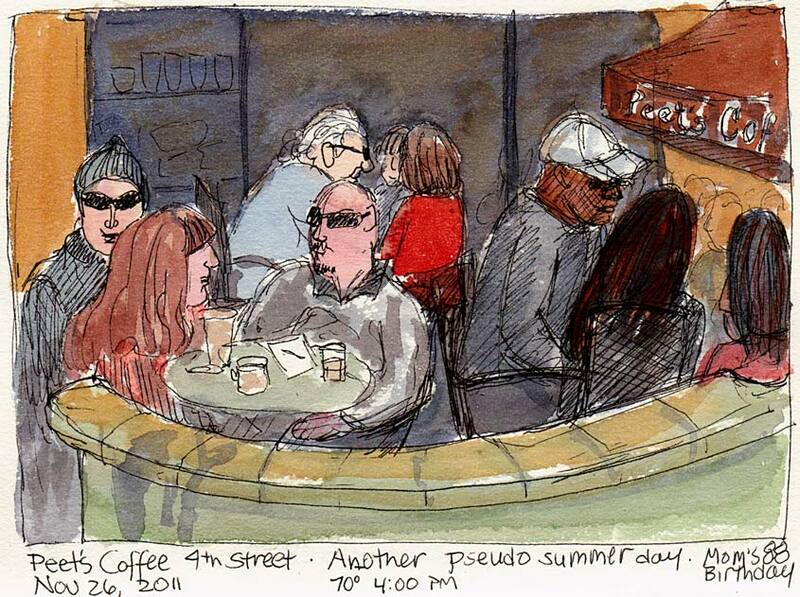 It’s great being able to sit out on the patio at Peet’s and sip coffee (decaf these days) and sketch. But it just feels weird. Where’s the rain, the cold, the frost, the storms, the cozy days indoors? Is your weather weird too? Take the poll below. It’s starting to get cold as sundown approaches. Our high today was 47 degrees, which I find is the average high for December in Washington. Is predicted to be 28 degrees F tonight, which is five degrees below average (brrrrrr!). However, it has yet gotten cold enough to persuade my teenage daughter to wear her coat. Kids! The people in your drawing, however, look very comfy and toasty! Weather here is cold and wintery, but about average for December in Oregon. I really enjoyed your weather when we were in the Bay area. So sorry that we didn’t get a chance to meet up and sketch. In retrospect it would have been more fun to do that. The weather hasn’t been as cold as predicted earlier this year. This time last year we’d already had snow, at least once. I don’t miss the snow! It looks wonderful be as warm as you are, but also would feel weird, I think! But at least you’re getting out and enjoying it! We have swapped weather Jana. You have our summer weather, we have have your winter. Very happy to return it to sender! Love your sketches. So full of personality.